On Tuesday, I was proud to join my colleagues in launching the Yellow Pages Caucus with a press conference outside of the Capitol. Currently, the Federal government owns and operates hundreds of activities that are commercial in nature and are not inherent to government. The Yellow Pages Caucus was formed by a group of Members of Congress dedicated to empowering the private sector. The Caucus believes that if an activity is available from a private company found in the Yellow Pages, it should either not be a responsibility of the federal government, or it should be performed by a private firm under contract with the federal government. 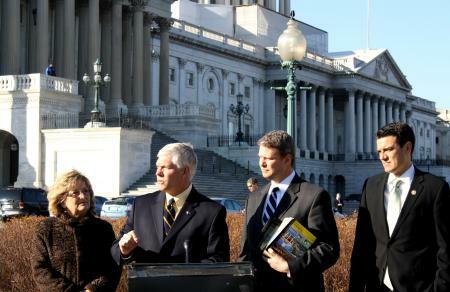 Members of the Yellow Pages Caucus are: Congresswoman Diane Black, Congresswoman Marsha Blackburn, Congressman Bill Huizenga, Congressman Tom McClintock, Congressman John Duncan, Congresswoman Lynn Jenkins, Congressman Mike Coffman, Congressman Mo Brooks, Congressman Jeff Duncan, Congressman Richard Hanna, Congresswoman Nan Hayworth, Congressman Kevin Yoder and Congressman Todd Young. I look forward to supporting legislative initiatives that meet the goals of this caucus, and will continue to update you on our action in Congress to fight for smaller government and a thriving free enterprise system. Omnibus Appropriations, Special Education, Global AIDS Initiative, Job Training, Unemployment Benefits, Labor-HHS-Education Appropriations, Agriculture Appropriations, FY2004 Foreign Operations Appropriations, U.S.-Singapore Trade, U.S.-Chile Trade, Supplemental Spending for Iraq & Afghanistan, Flood Insurance Reauthorization , Prescription Drug Benefit, Child Nutrition Programs, Surface Transportation, Job Training and Worker Services, Agriculture Appropriations, Foreign Aid, Debt Limit Increase, Fiscal 2005 Omnibus Appropriations, Vocational/Technical Training, Supplemental Appropriations, UN “Reforms.” Patriot Act Reauthorization, CAFTA, Katrina Hurricane-relief Appropriations, Head Start Funding, Line-item Rescission, Oman Trade Agreement, Military Tribunals, Electronic Surveillance, Head Start Funding, COPS Funding, Funding the REAL ID Act (National ID), Foreign Intelligence Surveillance, Thought Crimes “Violent Radicalization and Homegrown Terrorism Prevention Act, Peru Free Trade Agreement, Economic Stimulus, Farm Bill (Veto Override), Warrantless Searches, Employee Verification Program, Body Imaging Screening, Patriot Act extension., Supplemental Appropriations, Patriot Act Extension. Ban on UN Contributions, eliminate Millennium Challenge Account, WTO Withdrawal, UN Dues Decrease, Defunding the NAIS, Iran Military Operations defunding Iraq Troop Withdrawal, congress authorization of Iran Military Operations, Withdrawing U.S. Soldiers from Afghanistan, Libya Troop Withdrawal.